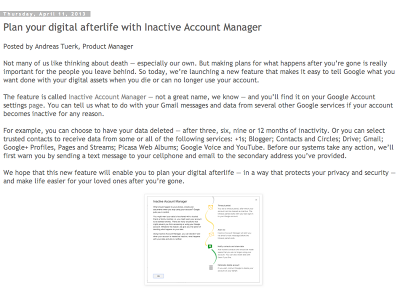 jojoebi designs: What will happen to YOUR digital content if you die? 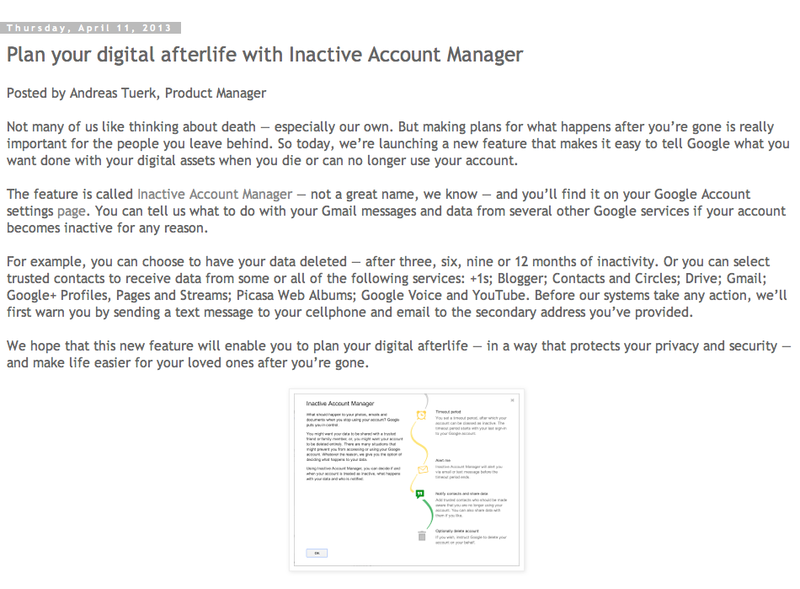 What will happen to YOUR digital content if you die? A friend who works for Google sent me this info a couple of weeks ago, I put it on my to-do list, not the Have-To-Do-Today list but the other one, the Have-To-Do-Sometime list, I know you have one of those too! Anyway, after the recent tragic news about Kathreen, I put my arse into gear and got it set up. Now, I know some people are thinking, why do I need to do this, my partner knows my password. But what if, your partner were to die at the same time? What if, you get divorced and it turns nasty? What if, your partner takes your death badly and just can't cope with the thought of dealing with your online life? There are so many more what if's out there! My 'problem' is that I change my passwords monthly and really can't expect my husband to remember the latest one! The whole thing can be a logistic nightmare for those who are left to deal with your online life and the different companies have different ways of dealing with it. 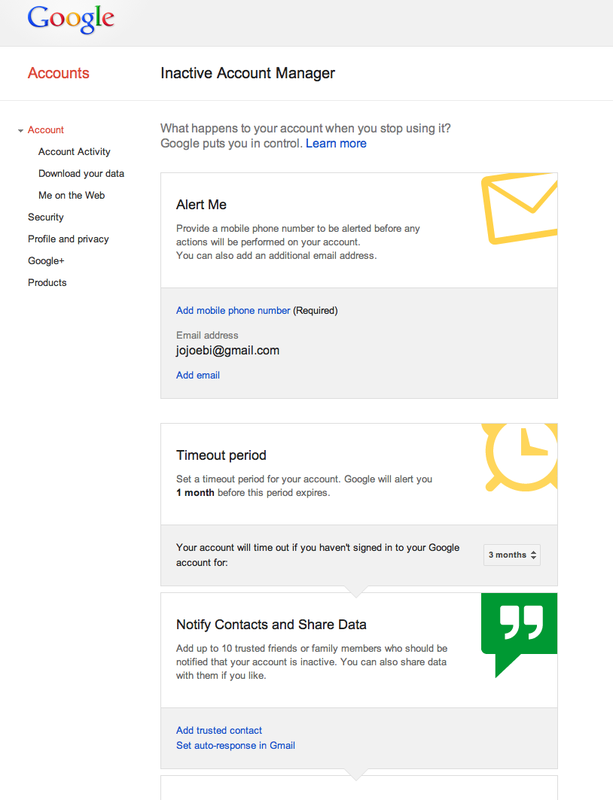 Google won't shut down an account without a court order (US), Facebook on the other hand prefers to shut down the account or will leave it as a "memorialize" account, so people can still connect but no one can log into the account. Yahoo & Twitter will deactivate an account if proof of death is given but won't allow access to the account and so it goes on, there is no universal standard! I think the way Google has this set up is certainly a step in the right direction. The website DeceasedAccount.com has a list of policies of most of the social network sites and so if you are into social media, it is worth checking out to see where you stand. Of course, it is not just social media, what about Paypal, frequent flyer miles, itunes, Amazon? - so many places that your spouse would need access to. One option is to set up a digital will and testament. With Secure Safe, you can store documents and passwords and then let your trusted people have an activation code to use if and when the time comes. You can store 50 passwords for free with one beneficiary. 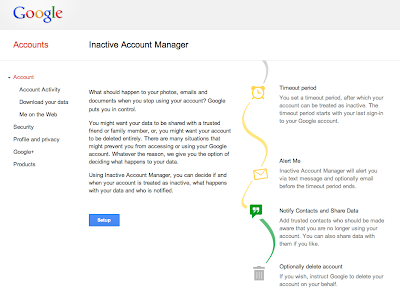 Click through to THIS page (or you to your account settings page and it is under Account Management) and click on Inactive Account Manager. Work through the set up, it is very straight forward. First add your mobile phone number and you will be sent a code instantly - pop the code in the box. This is for security reasons to make sure no one is accessing your account when they shouldn't be! 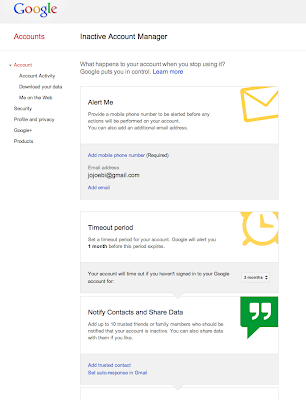 Your default gmail address should already be there and you can add another one - useful if you don't use your gmail account as your main account. Next, choose the time out period anything from 3mths to 18mths. Now the hard part.... You can pick up to 10 people to be notified that your account has been inactive for whatever time you set for. You do it one at a time and you need to write a message too - I found this bit particularly hard to do. I added my husband and a couple of close friends/relatives. I also let them know that I had done it! Finally you can choose whether to delete your account or not. Then Click ENABLE and you are done! To close a PayPal account (according to info on the Paypal community forum) for a deceased account holder, the Executor of the estate needs to fax the following documentation to (402) 537-5732. 1. A cover sheet that states the account holder is deceased and the Executor wishes to have the PayPal account closed. 2. A copy of the Death Certificate for the account holder. 3. A copy of the deceased account holder's will or legal documentation that provides the information regarding the Executor of the Estate. 4. A copy of a photo ID of the Executor of the Estate. The faxed documentation will be reviewed and, if approved, the account will be closed. If funds are available in the PayPal account, a check will be issued in the account holder's name, as the Executor of the Estate will then have the ability to cash the check. I am sure all this information will change and be updated as time goes on and more people start to think/worry about the situation. You can get a head start and do something today... just in case! Found this useful? Or do you know someone who would? Wow, I have seriously never ever thought about this. But you are right, we really should deal with this now. Thanks for pointing it out! Brilliant...and timely. I have a spreadsheet with all my passwords, but this is great! Is this so nobody can hack your account when you are gone? 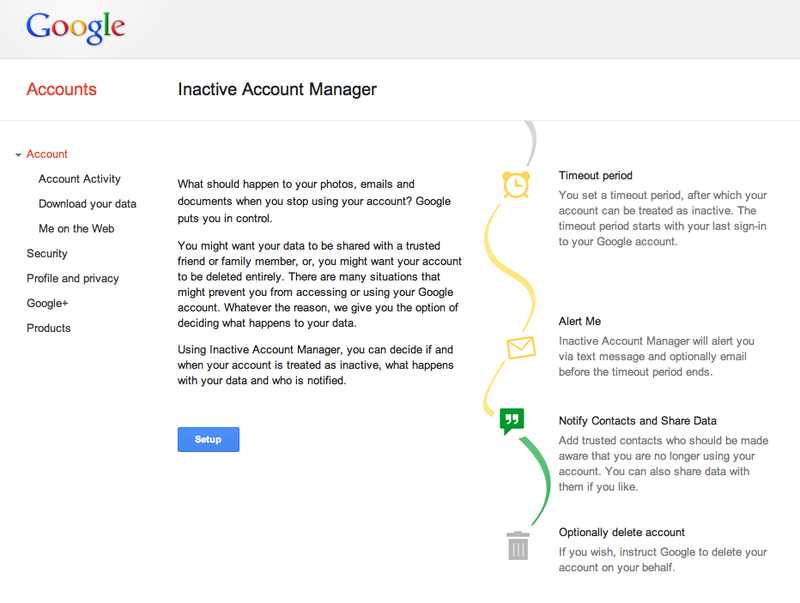 I guess I always thought the accounts would automatically deactivate over time? Not all accounts are deactivated, some won't be closed down without a court order. Depending on what you do online you may have money or points worth good money that would need collecting or you might have other sensitive information. It is possible that you use some online storage for your family photos and if your home was wiped out, that would be the only back-up, that you may want your children to have access to when you have gone. So it is not just about having your account hacked, it is for those left behind removing anything or downloading anything that you might want passing onto your kids. Or just closing down pages and sites that are no longer needed. If you have an online shop - Etsy for example - if you died but Etsy leave the shop open, and no-one else can access it but customers keep buying things, it could cause your partner all kinds of problems.